Dr. Lucy is really interested in what’s happening behind the scenes and has already started exploring the museum’s on-line collection to find out more about the museum’s artifacts and how they can be used to inspire an appreciation for Ontario’s cultural diversity. 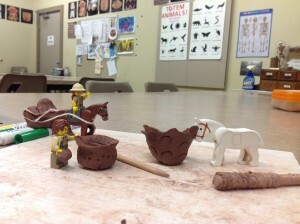 Dusty and Seabiscuit are really looking forward to checking out all the fun stuff our future archaeologists are doing at the museum during Summer Camp and Ontario Doug can’t wait to help out during the Youth Dig-It Camp in August. Ontario Doug exploring the Jury Model. One of Ontario Doug’s first stops in the Museum was the Jury Model. Built by Wilfrid Jury and his father Amos in 1933, the model depicts the visit of the Jesuit priests Jean de Brebeuf and Pierre Joseph Marie Chaumonot to the Attawandarons. The Jesuit Priests traveled from their mission, “Sainte-Marie among the Hurons,” to this district in 1641. 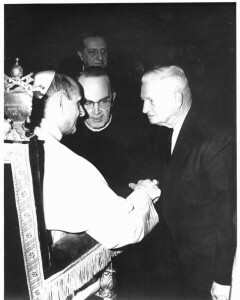 Wilfrid Jury with Pope Paul VI. For four years, Wilf and Elsie conducted excavations at St. Marie I and completed extensive archival research about the site and its occupants. The site became an attraction, visited by thousands, and Wilf became nationally recognized. 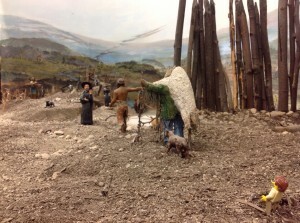 In December 1964, Pope Paul VI granted Wilf and Elsie audience and gave his blessing to the Ontario government and all that were involved in the excavation St. Marie I.
Ontario Doug is particularly interested in this early diorama because of its connection with Wilfrid Juryand Sainte-Marie among the Hurons.